How picturesque was Joseph and Kendra Duggar's wedding? 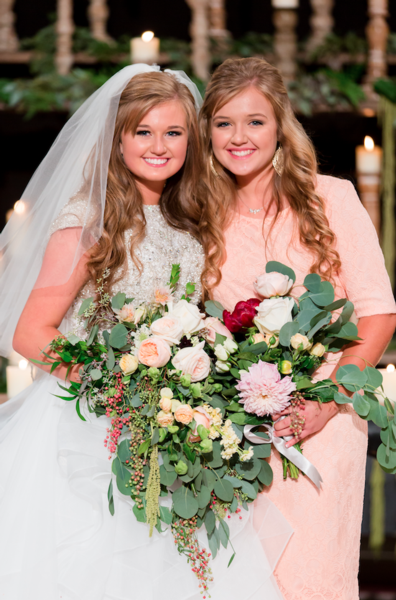 Kendra was a stunning bride, and the two make a beautiful couple. Below are a few photos from the day. Photos are property of duggarfamily.com and may not be used without written permission. 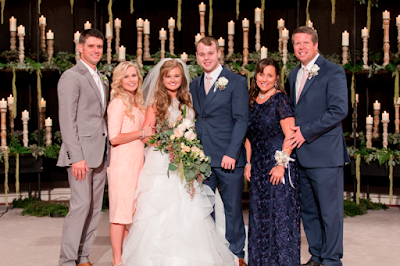 To view the full album, visit the Duggars' website. They seem like the sweetest couple! Thank you for starting this commentary off with something nice. If you have read everything else you know that it is mostly not so nice. Yes they are the sweetest couple and I think that they will have fun together. Agreed. I do not like hat. I told my husband I’d kill him if he did that...45 years ago. He did not. I agree. It seems sloppy and disrespectful. She’s a 19-year old girl. Not surprised. Silly. Totally agree with you. A sweet gesture turned into a joke - and a mess. A lot of people do the cake smash thing. It isn’t something new. I don’t know how or why it got started, but I do think Kendra was still sweet about it. She didn’t get it in his hair or all over his clothes. agree; it's not funny or cute or kind. sort of humiliating. not a good way to start. I must be out of step, but I don't consider smashing cake into your new spouse's face "fun". It's rude and childish. I thought the whole wedding was childish, from nervous giggling to crying to needing Daddy to that speech he made to the ring stunt. It was not a reverent church ceremony, so cake smashing at the reception fit right in. I've not seen a lot of maturity yet on Kendra's part. Can someone cite missing examples? I totally Agree! I was really shocked to see her do that, Let alone know her Mom put her up to it!!! Yes...everyone knows spouses who laugh together, play, and are just generally silly with each other will be divorced within a year. Give me a break. My husband and I love to mess with each other and I attribute our 14 years of marriage to how much we laugh together and our ability to act lighthearted or “childish” even when times are hard. Our kids are also learning by example that they don’t have to take everything in life so seriously and part of God’s plan for our lives is JOY! Showed her age, for sure. THANK YOU 3:46!!! You are so right! The difference is mature people know when it's appropriate to be silly in public and when it's not. I know women (even men) a decade or so older than Kendra who still have a tendency to giggle a lot, especially when nervous. I think that's more an issue of personality than age. I got the sense SOME of the "childish" aspects of the wedding may have been added to cater to the TV audience. Pastor Caldwell kept using his phone as a Teleprompter for his "joke" speech and I got the sense he's not used to giving that kind of sermon. And this whole "Josiah loves practical jokes" idea is one that was totally new to me. He does like to crack jokes on camera, so I don't think they made it all up. But I do wonder if he came up with the ring stunt all by himself, or if someone suggested it to him as a way to make an impression on the TV audience. So I'm pretty sure Lauren was already in the picture by that point and the show was looking for an angle to introduce Josiah to the audience as a more central "character", so when they start to show him courting the audience isn't like "Uh, who's that, is that Jeb or Jed" (as I'm sure the casual viewer doesn't really keep track of exactly which Duggar is which). At least that does help alleviate some concerns I'd have otherwise that Josiah and Lauren are rushing their relationship too fast, if they had some kind of "pre-courtship" going for 2-3 months at the end of 2017 before they made it official in January this year. Unless it’s your wedding, you’re gonna have to get over it. I think it's silly, they thought it was playful, we're all going to have different opinions on it. That was the tradition when I got married in 1961. I remember when it became a tradition too. I have always thought was a foolish way to begin a marriage. I made it very, very clear to my spouse that wasn't a tradition we would follow and he quite agreed. Same at our wedding. My husband and I agreed it was not the thing to do! They are young and fun! She gently speared a little icing on his mouth, to read the comments you would thing she took half the cake and pounded into his face. She was smiling at him m with mischievous joy and even if he was a bit annoyed at first that moment will be a special sweet personal memory of that day. I met a man in his late eighties, his wife had recently died his memories were of his bride and their special day. He said she put cake on his face and he kinda got mad......then he said “I’d give anything for her to still be here to put cake on my face”. Kathy -- You just put it all into perspective. Before I make this comment I want to wish everybody a Happy Easter & A great one on Sunday. Wow Kendras parents look like a famous celebrity couple. Her mom looks like a country music star. Hard to believe that is her parents. They look young enough to be her older brother & Sister. Lauren looks like Kendra. Love the photo of both parents standing next to their child. & The photo of Kendra smashing cake on Joe s face. Thank you for setting up more photos of their wedding. Maybe she should have gone with what Joe wanted. He didn't seem to enjoy it. Anyone else find it odd when she mentioned she wasn't tempted to kiss her now husband till after they got engaged? No, I think it's classy and responsible. She stuck to her standards. Nice to see in this culture. I respect their standards, but yes, it's odd. Many of us are tempted to do much more than kiss when dating. Anon @ 2:03. Its the norm in 'this culture'! 2:03- Sticking to standards is one thing. However, to say you're not tempted to kiss your future husband is odd, as it suggests the desire may not be there. Either that, or you're just kidding yourself- which has nothing to do with being classy or responsible. Yes it is. Young people in love will be tempted. It is normal,especially with their system awash with hormones. It does not mean she will not do it. In fact, one would respect her more because she would have had to struggle to maintain her standards. There is a difference. So,not classy and responsible but sad. Either this young woman had been brought up to believe good women are to be just passive and that any kind of physical contract is to endure or she is not attracted to her now husband. I hope she just said that because she thought it is what she should say. I can understand her not looking forward to their first kiss being in public. First time can be awkward. Better that it is done in private. Yes,3:25. It is odd to not even be tempted to kiss your fiancé. You should be attracted to the person you will be marrying. She said she wasn't tempted until AFTER they got engaged, which means when he became her fiance. I took that to mean she tried to not think about it or become tempted until she knew the relationship was officially leading to marriage. It was smart on her part in case things didn't work out. Let's not twist her words. @8:34 A young healthy woman in the first flush of love, engaged or otherwise,would want to kiss the object of their affection. Hormones are very powerful, especially when you are physical attracted to the person. Young women feel this attractive as much as young men. Your comment implies that kissing someone you are not married to is somehow evil. And that this young woman can somehow think her way out of it. She could only do that if she was not attracted to the young man and/or she was brought up to think that a good woman should feel no sexual attraction at all. People kiss each other to show affection. It is not some terrible thing that should be avoided and should be described as falling into temptation. There appears to be an unhealthy double standard here. I didn't like the cake smearing. I thought it was classless. It's not a tradition to push cake into your new spouse's face. It's a childish choice. We got married in 1961 too and we didn't do it nor did anyone else we knew. Disappointed her mother told her to do that-Kendra I think regreted her actions because she spent a lot of time wiping his face off! The tradition of feeding each other cake comes from the fact that the spouses owes each other food now that they are married. Smashing food in each others' face is totaly rude to me and goes against this beautiful tradition of taking care of each other. I hate it when one smashes cake into the other ones face. We didn't do that at our wedding and at that time I never even heard of it. Kendra's parents are ridiculously young and attractive looking! I'm sure they get tired of hearing how young they look but what gives? Do we have a Tuck Everlasting situation going on here 😉? They probably got married at 18 also so they’re only in their mid 30’s. I was in first year university and my mother came to visit and every guy in my dorm was "hitting on" her and it was a mix of pride and embarrassment that they thought she was my sister. She was 40 yrs old and took very good care of herself but she dressed age-appropriate (ie like 40 yrs old, not 18 yrs old). We also got asked at the mall or movie theatre very often when I was a teen if we were twins. Again, a mix of pride & embarrassment. Mostly pride now ha ha that I am older. I did NOT like Kendra’s decision to smash the wedding cake in Joe’s face. Joe took it like a gentleman and did not mess up Kendra’s makeup. Kendra’s mom should not have encouraged her to smash the cake in Joe’s face. Maybe it was because the Caldwells were paying? It will be interesting to see if the Swansons pay for a nice reception too. I think what happens at a reception depends on the number of wedding guests. If you have a huge number of guests a sit down reception isn't going to work well. I think there were about a thousand guests a Joy's wedding. That was too large a number to seat a tables unless you rented some sort of arena for the reception. Jill and Jesss didn't want a big reception.. Jessa doesn't like cake. And their reception wasn't chep. It’s an old tradition & he didn’t seemed bothered by it one bit. Nobody else’s biz. Nuff said. Cute couple so much in love. Sweet. Wish them a lifetime of love & happiness. It’s actually not that old of a tradition, and it’s really immature. You need to re-watch it. He certainly did look like he didn't enjoy it. Yes,not that old of a tradition and in some places,never done. I been married 30 years and my siblings,over 40. No cake smashing done.Hard to do with wedding fruitcake. You saved part of the cake to have on your first anniversary and guests all went home with a small piece in a fancy box. I don't understand the tradition, either. I asked my husband not to do that, and we just fed each other. Who wants to clean up a cake/make-up mess? Or get it out of your dress, hair, or rented tux? I personally thought they just looked like they were best friends. A lighthearted couple,( The joy of the Lord is our Strength ) which will get them through tough times. If you noticed even in smearing the cake in his face, she did it playfully and gently, and took care of him afterwards. He is always suprising her. It looks like they have a lot of fun together. Every couple has there own style. When did things have to fit in a certain mold? If it don't it's immature?? I personally don't understand the criticism. What matters most is they put God first, and it seems like they do. It shows Christians don't have to be stuffy. They can be silly, and playful.Praying for this beautiful couple. Joe wasn’t smiling about it, and seemed embarrassed which is why I didn’t like it. I've seen many worse examples of cake smashing than what Kendra did. She didn't actually get it into Joe's hair or clothes and quickly wiped off what got on his face. Lily and Ellie: Are you aware that a number of people are having problems connecting with your Duggar family blog site? When you put the blog name in and try to connect it comes up site cannot be reached. I am only able to write this because for some reason I was able to click on one picture below the site name. I know I'm not the only one as I have seen others say they are having the same problem (it is only on this site, Bates and Nashville wife are ok) a number were commenting that they thought the blog had been taken down. Could you look into the problem please. Thank you. I think of cake smashing as rude, disrespectful, tactless, classless, etc. why does everyone think it funny to start out a married life doing that? I would've never dreamed of disrespecting my new spouse like that. We were all about caring, loving, sharing. I don't remember if we gave each other a bite of cake but if we did it would've been given tenderly not unloving smashing. For people who are so much into the Lord, the wedding seemed like a joke. The father of the bride who is also the minister who makes a speach about how much it cost to raise a child.That was for the rehearsal diner or the wedding reception but not the wedding per se. Also on his cellphone all the time. The part about the ring and the guy coming down from the ceiling was really disrespectuful to the lord and to the institution of marriage. The cake smash was very disrespectuful of her new husband. I didn't like this wedding but I thought Joe seemed like such a sweet guy. It didn’t seem like a joke at all. They looked like they were taking their vows very seriously. Joe was so sweet when he started crying as Kendra came down the aisle. Her dad can say whatever he wants during her wedding since he was paying for it and doing the ceremony. He tried to make some of it light hearted. He was joking some but also being very serious that it was now Joe who would be responsible to love and care and provide for his daughter. The fact that Josiah did something funny with the rings was not planned as part of the ceremony. I thought it was funny, but it didn’t last long either way. I think the Lord has a sense of humor (look at all of the funny looking animals He has created). They didn’t say or do anything that disrespected God. They didn’t laugh about their vows or skip them. They all prayed together. It was a beautiful ceremony with several memorable moments. Cake smashing is nothing new. At least she didn’t get it all over him or in his hair. Some people do think it is funny. She was smiling and laughing the whole time, so she obviously didn’t do it to be disrespectful. I do think the cake smashing tradition is a little odd. Although when my parents got married they decided to spice up the cake smashing ideas. Instead of each other, they smashed the cake into their best man and maid of honor! The guests laughed like crazy. No one saw it coming! You parents were very rude. What if their Best Man and Maid of honor were diabetic they could have got sick. I would have had your parents arrested and but in jail for doing that. Even better would be if you threw cake at all of your wedding guests, starting with grandma! What a hoot that would be! I've seen that too at a wedding! So funny! Waste of good food, and not funny. @11:06 first, I think the bride and groom would know if either the best man or maid of honor were diabetic, second, they don't have to eat it its just in their face, and third, no one is that dumb to arrest someone for smashing cake in their maid of honor and best man's face. I don't think that's funny. Red warning flag there.After all the work and help that they helped you with for the wedding and then they would go smash cake in their faces? I guess I would take my cue that my work went to mr unthankful and mrs ungrateful and know where I stand in the line of true friendship. Her parents knew their best friends well enough to know if they are allergic to cake and if they would be ok playing a joke on them. People don’t need to take everything so seriously. People criticize the Duggars for everything. I do not think she is immature for smashing cake. My husband rubbed icing on my nose as here we are 6 years later. I don’t think Kendra’s to young to be married. It’s not that strange that she didn’t have a desire to kiss. I am not bothered by the cake smashing but what indeed does bother me is that their religious wedding ceremony seems a lot like a tv circus. Standing for God and making this commitment, starting out a life a husband and wife is a serious step. And the Duggars made it into a tv circus with "funny" jokes and ridicoulus wedding parties. That is not what a wedding is about. There is nothing wrong with sweet and funny anecdotes about the couple in the sermon but they seem to put much more emphasis on the wedding party, funny action and kissing than the importance and meaning of a wedding itself. And this is definitely not just aimed at Kendra and Joe. I agree. The ring stunt really bothered me. Bothered me too. It's supposed to be a holy and reverent time. Instead it's become the opposite for money making. Personally, I don't like the cake-smashing thing, either. It is, however, a cultural thing that is accepted in this country (the U.S.) but would not be accepted in other countries. That being said, it is not the most important issue in the world. 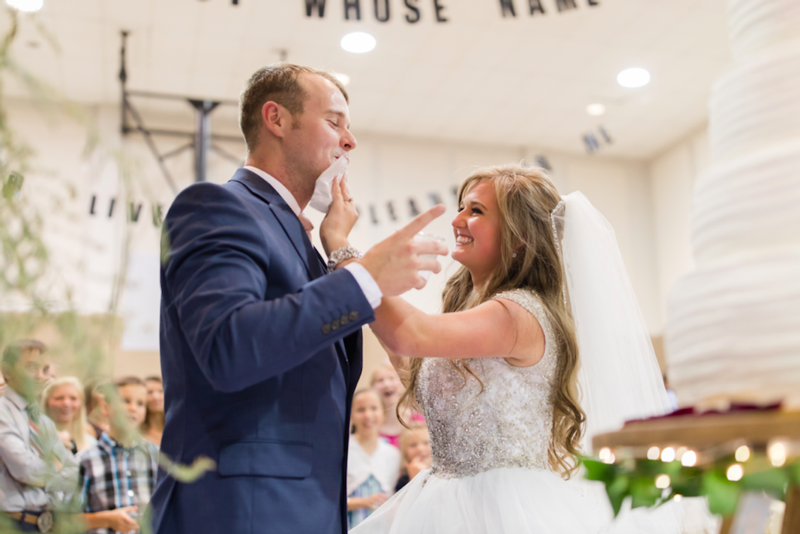 I love the Duggars, and think that their values trump those of many others both in this country and others, so the cake-smashing is a small issue in the grand scheme of things. I still don't like it, but would take in any day in exchange for being able to have been raised like the Duggars/Caldwells/Bates, etc., etc., etc! Those bouquets are much too big. It overwhelms Kendra's dress. The girls look like they're holding a potted plant between them. Lauren is gorgeous, and seems so sweet. Wow, so many hateful people. The cake smashing thing is so trivial and done all the time. A perfectly sweet couple getting bashed. Love these two. Why is Michelle ALWAYS lurching forward in photos?! Can she not stand up straight? I sincerely want to know. Looks terrible. Well, she has birthed 21 babies, including Caleb and Jubilee. That has to do something to your body, right? All the girls/women hunch forward like that. Makes their heads look like those bobble-head toys. Cant figure out why Michelle and all of them do that either. 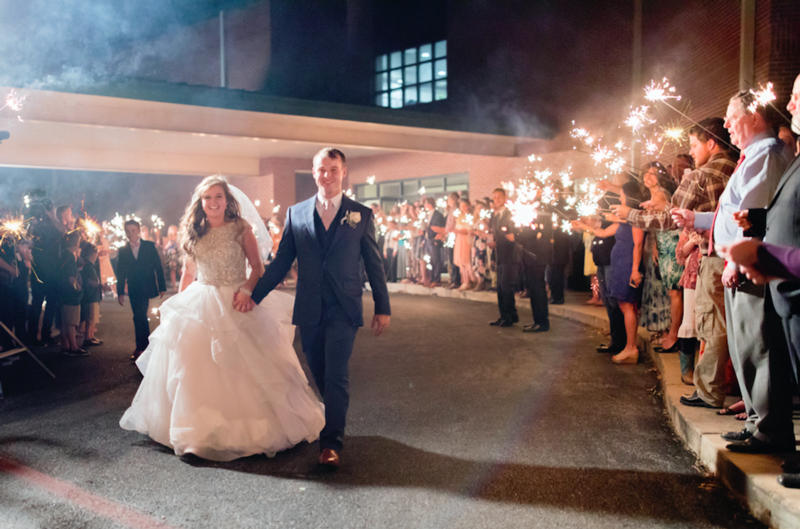 Joe and Kendra's wedding was beautiful. I think she may feel like she has a pooch tummy and she probably thinks if she leans forward, it won't show. I would bet that she was told to do that by professional camera people. I would really like to see pictures of your family and events and obsess over every little thing. How would you guys feel. Very petty. Kendra's mom is drop dead gorgeous ! PLEASE BACK OFF!!!!! Yes, it was a bit of a different wedding but they were happy and that is all that matters. If Joe did not like what Kendra did, he would have talked to her about it. Or he would have talked to her mother. How would you like a bunch of strangers critizing your wedding?! This commentary is turning into a new season of MKR! Just please calm down and be nice. They are a happy couple and f they disagreed they would have sorted it out. Now please stop this silly rudeness! THANK YOU!! I find it funny that so many have an opinion on how Joe and Kendra’s wedding should’ve gone down. I think you’re missing the point that the wedding was theirs! I didn’t like the cake smashing. But I’ve had friends who’ve done it and I didn’t say anything because it was their day to enjoy!